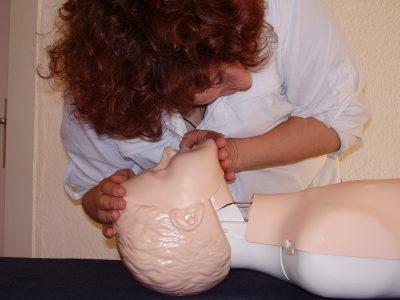 First Aid is helpful to know for family or business purposes, or any other place where it may be needed. St John Ambulance Australia had sent me an email today, advocating for me to refresh my CPR qualifications on an annual basis. The reason they gave was that within two months there is a 50% decrease in CPR skills and after three years only 2% of people can perform CPR effectively. Just recently I needed to take my three yearly refresher course. I have taken my update qualifications every 3 years since joining my Professional Association in 1992, which was a requirement of continued membership. I have only ever had to use my knowledge once, and that was in a hospital room when visiting a friend, whilst another patient in the same room lost consciousness (a self-caused condition through smoking). I did CPR while waiting for a nurse to arrive and take over. A one-off need – hardly the need to have First Aid At Your Fingertips, or to have to repeat a First Aid Course every year. But, I suppose it would be nice to have the knowledge in my back pocket so to speak, incase I got a mental blank on what to do with something unusual. I really don’t expect to remember everything unless I use it on a repetitive basis. We can’t keep everything in our conscious mind, so if I don’t use any information from the past, it goes into the subconscious to be buried as other more used skills go over the top of it. I have no problem in believing that after two months, there is a 50% decrease in CPR skills if you don’t use it – even after 25 years. I have often wondered if an emergency arises, just how much I will remember. However, the book and bandages that come with each course update were given to me to refer to, and this is kept in the car in case I need to check anything I am not clear about should an emergency arise. But what if I am not near the car? And let’s be honest, what I am saying here can be applied to any course or learning that I have undertaken, on whatever training I have completed. I was thinking that it would make more sense to me that the St John Ambulance in this day and age sell an app and download of the book to keep on our phones, so that we can keep that book knowledge to refer to on our mobile phone which we keep with us wherever we go. This way you can have links that take you directly to the problem in hand as a reminder of what to do. Doesn’t that make more sense? Then blow me down – I came across the fact that they already have. A story about funny man Jason Pestell came across my path. Pestell had done his St John’s Ambulance course. He came across an unconscious man in the street and did everything right. Jason called on his first aid training and St John Ambulance First Aid app to render life-saving first aid to the patient prior to ambulance crews arriving on the scene. You must-have iPhone, iPad and iPod Touch app. This is the link on itunes where you can read all about it. Now my next quest was to see if my phone a HUAWEI is able to download this gem. Unfortunately no says my guru friend. Now I need to find out if my HUAWEI is an Android Operating System – back to my guru friend… and yes, he confirmed that it was. I already had a Google g-mail account so I used that plus my password and WOW! The First Aid Course is now downloaded to my mobile phone and works great. Even has an answer section and test section. A must get for everyone. You never know when you might need it. I have now changed my HUAWEI phone for a Samsung and found that I was able to move the App across with all my other contacts etc. how easy is that? Incidentally, I still haven’t had to use the information since downloading it to my smart phone, but my mind feels a lot easier knowing that I have my First Aid Knowledge at my fingertips. I have posted this article in the hope that you might like to download this information too. But lets go back to my recent refresher course. One of the things the lecturer mentioned is that if you are in an emergency situation where you have assumed responsibility and become unsure of what to do – lets say you haven’t got a first aid manual on your phone, by dialling 000 you are accessing an expert at the other end of the phone line that can talk you through what you need to do. And may I suggest that you don’t forget to donate to the Red Cross or St John’s Ambulance for the good work that they do. Whilst the links I have given are for people who live in Australia, I would imagine all overseas countries would have a similar system.